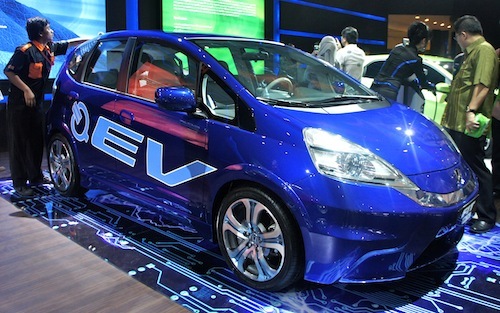 Honda first showcased the Honda Fit EV at the LA Auto Show last year, but this is the first time our team has been able to snap live shots of it, thanks to Honda showcasing it at the 2011 Indonesian International Motor Show. We even have a short video of a Honda model demonstrating how one would “refuel” the Honda Fit EV. Unlike the conventional gasoline powered model, the Fit EV has its fuel flap located at the front fender of the car just below the A pillar. As a recap – the Fit EV uses a coaxial high-density electric motor derived from the FCX Clarity fuel cell electric vehicle, but instead of powered by a fuel cell it is powered by a charge stored in a lithium ion battery. The car will have a top speed of 145 kph and offer a 160 km range per charge, which takes less than 12 hours when using a conventional 120V outlet and less than six hours with 240V. For more information on how the Fit EV works, check out our previous post. Look after the jump for a live gallery.